Carbon Dioxide — How much is too much? | Climate S.W.A.G. Carbon Dioxide — How much is too much? My last post differentiated between air pollution and carbon dioxide. It finished by posing a question. If some carbon dioxide in the atmosphere is good, when is there so much carbon dioxide that it becomes bad? Climate activists answer this question unequivocally and with a confidence that confuses me . There are so many variables and too many unknowns. Confident, well paid scientists seem to be everywhere. The IPCC (Intergovernmental Panel on Climate Change) states in their latest Synopses Report that they are 90% certain most warming since 1950 is man caused. Climate activist James Hansen has said we must return to the 1990 level of carbon dioxide or we are all doomed. Global Climate Project executive director Josep Canadel sounded concern in a recent NY Times article. He was worried — a goal of 2 degree C rise in temperature might not be attainable even with an immediate, large and sustained global mitigation effort. Where they see clarity, I see problems, lots of problems. Problem number 1 — temperature moves around a lot. This is one of my favorite themes. Past posts have used 4 different temperature graphs to demonstrate the variability. I’d like to start by revisiting those graphs. The most accurate information is the newest and my favorite new data is satellite based. In 1992 the IPCC said we’d be going up at .3 degree C per decade and that we’d be a degree C warmer by 2020 (using 1990 as a base year). Well they were right until 1998. In 2007 they altered their estimate to .2 degree C. I wonder what they will say in 2014 in their next report. 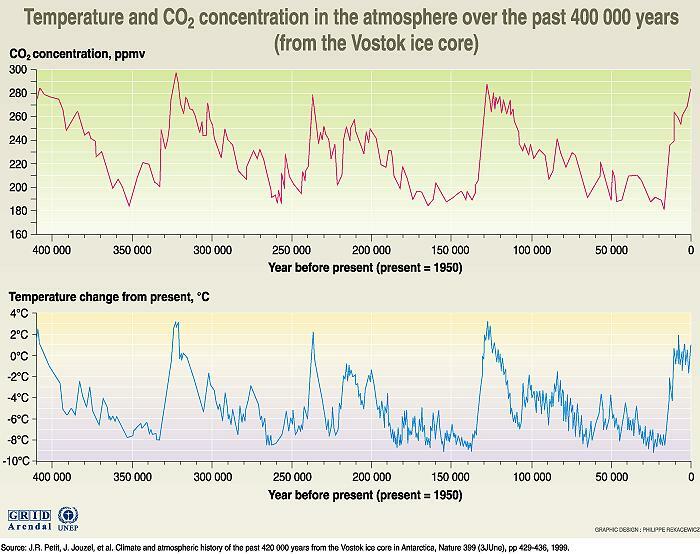 The last 10,000 years look pretty harmless in the Vostok core. One reason I am a skeptic — the correlation between carbon dioxide and temperature is flawed. It is easy to see in Antarctic Ice Core graphs. Sure, the charts (carbon dioxide and temperature) have the same shape generally, but there are lots of places where temperature and carbon dioxide diverge. It looks to me like temperature leads…and carbon dioxide follows. Temperature changes first, followed by a change in carbon dioxide. Climate scientists insist the correlation is the other way around. As any good scientist will tell you…a correlation proves nothing. The correlation provides a starting point. An experiment to confirm or deny the assertion assumed in the correlation is the next step in the process. The earth is very difficult to study, there are no spare Earths handy. A proxy is needed, and the proxy used is computer modeling. I don’t trust this type of science. I miss the experimentation. Climate scientists make assumptions, generate computer models, and use the output of the model to verify their assumptions. Can you say SWAG. The IPCC admits to not knowing lots of stuff. A chart of Radiative Forcing Components on page 39 of the 2007 Synopses shows a low LOSU (level of scientific understanding) about several items that they admit could be important. What do you do when you don’t know….you guess or you leave it out of the model. If you leave it out, it better not be important. Lots of models are run with different guesses. SWAG and WAG are here, there, everywhere! Problem number 3 — Model results are inconsistent. Table 3.1 on page 45 of the 2007 Synopses has the following data. The Synopses uses Scenarios. Each Scenario has an assumed carbon dioxide production profile that is described earlier in the same chapter of the document. The chart is predicting temperatures that are expected at some time between 2090 and 2100. The likely range includes 90% of the models. Another 10% lie outside the stated likely range. The first three scenarios are unlikely (my opinion, the Synopses states that no attempt has been made to quantify any of the scenarios). The assumptions built into the scenarios do not match the real world. I’d guess we will actually end up somewhere in between the A1B and the A2 Scenarios. The range of values is actually a bit less precise than this chart would indicate. The predictions were made in 2007 but the base line they are adjusting from is the average value during the period from 1980 to 1999. The world was warming steadily for that period, so all the numbers are inflated by about .2 degree C. The temperature in 2000 was .2 degree C above their baseline. Models that agree are varying by anywhere from 2.7 to 3.4 degrees C only 90 years into the future. 10% of the model runs show even bigger changes. That’s a lot of variation. I guess I’m a bit pickier than the IPCC. I think variation in model output makes the Climate prediction performed by the IPCC statistically unsupportable. The best estimate data point is then used by the IPCC in models that are then extrapolated centuries further into the future (table 5.1 page 67 of the 2007 Synopses). Table 5.1 predicts very specific temperatures hundreds of years into the future. That’s one sloppy WAG. What probability did the IPCC attach the their best estimate? Beats me. There’s no information provided. The best estimate is probably the mean of a bell shaped curve of a relatively small data set, but that’s just a guess on my part. I’d be the first to admit that carbon dioxide probably has warmed the planet…but quantifying that is an extraordinarily difficult task. The IPCC likes to make it sound like they know the answer, but they don’t. Nobody knows. This entry was posted in Climate Change, Climate Politics, Science and tagged carbon dioxide, global warming, IPCC, James Hansen. Bookmark the permalink. Not what I was expecting but nice anyway! Well done!